Why Choose Low-VOC Paints for Interior Painting in Annapolis? An interior painting project is a highly rewarding and enjoyable experience when conducted correctly. Often, the first step in the process is selecting the right paint for the job. In most instances, homeowners are only concerned about color. However, there is another consideration that you should make when you are choosing an interior paint: volatile organic compounds. 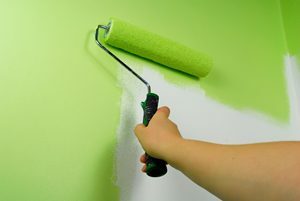 Volatile organic compounds, or VOCs, are found in most paints. Unfortunately, they are harmful to the health of people within your property and to the environment in general. For this reason, it is highly recommended that you choose low-VOC paints for interior painting projects. At Annapolis Painting Services, our interior house painters are here to help you make the most educated and rewarding paint choices possible. In order to help our customers better understand low-VOC paint and our eco-friendly painting practices, our experts have provided the following information. Call Annapolis Painting Services today if you have any questions about interior paints or if you need any help with your next project. Our staff would be happy to take your call, to answer any of your questions, and to schedule your appointment today with one of our expert painters. When Are VOC Paints a Problem for Interior Painting in Annapolis? The Environmental Protection Agency has set strict limits on the amount of VOCs that can be present in latex paints, specifically 250 grams per liter. These regulations have been set because VOCs are a major contributor to air pollution and smog. At the same time, these chemicals can also be harmful to your health, especially if you suffer from asthma or respiratory ailments. The primary time in which VOC emission is at its worst is when the paint is drying. VOCs are responsible for that fresh paint smell that lingers within a property. If you are trying to choose a paint that is best for your family’s health and for the environment in general, it is best to select a low-VOC eco-friendly paint. In the last ten years, there have been many advances in low-VOC and zero-VOC paints. Originally, when demand was low, these paints were far more expensive. Even worse, they were of a lesser quality that traditional paints that are high in VOCs. Because so many homeowners are not choosing low-VOC paints for their interior painting projects, manufacturers have responded with higher quality and more affordable products. You no longer have to choose between your budget and the health and well being of your family. Our Annapolis painting contractors can help you select the best paint for your needs and goals. If you are interested in eco-friendly, Low-VOC paints for your interior painting project in Annapolis, call Annapolis Painting Services today at 410-974-6768 or fill out our online request form.